NextPittsburgh – Founder and executive director of the region’s groundbreaking Mid-Atlantic Mothers’ Milk Bank — which opened in 2015 — Denise O’Connor is an IBCLC certified lactation consultant. She has worked with nursing mothers and their infants for 18 years. Passionate about women’s and children’s issues, Denise has also worked extensively with local nonprofits, including TRAC (Three Rivers Adoption Council), The Midwife Center and the Pittsburgh Toy Lending Library. A native of Emsworth, Denise lives in Franklin Park with her husband Robert — they started dating at age 16 — and their three children. I have one of the best jobs around. Great coworkers, challenging work and I meet adorable babies every day. The best thing by far, though, is seeing what donor milk has meant for our region. Before the Mid-Atlantic Mothers’ Milk Bank opened, none of our local hospitals were using donor milk for their vulnerable premature babies. Now, 100% of the higher level neonatal intensive care units (NICUs) in Western Pennsylvania are using it. NICU complications are dramatically decreasing and maternal breastfeeding success rates are going up. Some hospitals in Pennsylvania now use donor milk in their Mother Baby Units, and outpatient demand is increasing as clinicians are learning how donor milk can help babies with certain medical needs. How does Pittsburgh inspire and inform your work? When I speak with other, newer milk banks, I am reminded how truly special Pittsburgh is. Our path was easier and quicker than most. We have one of the largest and most engaged foundation communities in the country; they really stepped up. 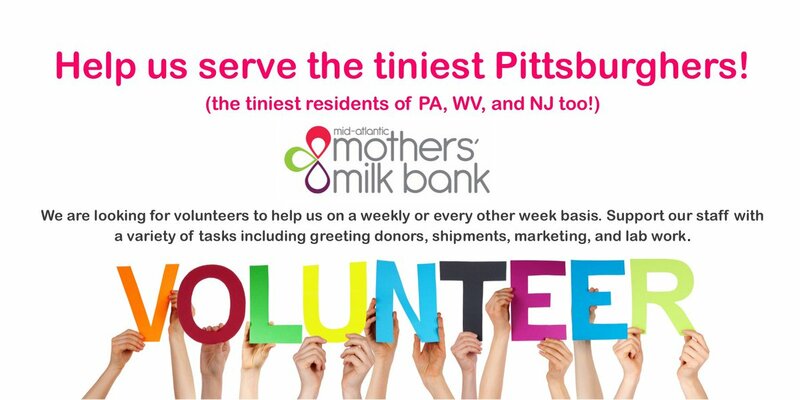 Our local clinicians, doctors and nurses from every Pittsburgh-area NICU (and health system), volunteer their time to make this Milk Bank happen. And the response we have gotten from our Pittsburgh mothers who have donated their milk is nothing short of amazing! It’s time to unwind. Where do you head? My garden. We have been organic gardening for a long time, but recently took it to a whole new level. Last summer, my husband and sons built a huge garden with steel raised beds surrounded by a cedar fence. We grow enough produce to feed my family and share! Last year, I even had a basket of vegetables for donors who were dropping milk off. Best thing about Pittsburgh or Western PA? There is just so much to do here. Big productions, smaller theater groups, art galleries, festivals and a vibrant music scene. I am particularly loving all of the neighborhood music festivals like the ones in Deutschtown and Allentown. Lately I’ve been listening to a lot of Jack White, Cage the Elephant and Greta Van Fleet. Broadway tunes are always part of the day because my daughter loves them. Right now, it’s all about “Les Misérables,” since she is in Comtra Theatre’s upcoming production. I’d say the 31st Street Bridge, which is right next to the Milk Bank. It has some of the most beautiful views of the city. It is particularly stunning in autumn with the fall foliage on the trees at Washington’s Landing and Downtown in the distance. Onion Maiden. It’s fantastic to see more vegetarian and vegan restaurants popping up all over Pittsburgh. We have tickets for Pittsburgh Public Theater’s “A Funny Thing Happened on the Way to the Forum” at the O’Reilly Theater. This spring, I am looking forward to learning about the latest human milk research at the Human Milk Banking Association of North America Conference in Denver. In April, we will be sampling all of the goodies at the Farm to Table Conference at the Convention Center. I like to take them on a little art tour of the North Side. Either the Andy Warhol Museum or the Mattress Factory, a visit to Randyland, and maybe a stop at City of Asylum/Alphabet City. Mid-afternoon refueling at Arnold’s Tea or Bistro to Go is a must. See more pictures and read the full story here.